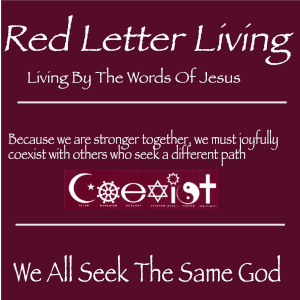 I started the RedLetterLiving blog in 2008 to seek answers to how closely Christian churches actually followed the words of Jesus Christ. What I found after almost three years of intensive study and over 500 posts was that while there are now nearly 39,000 different versions of Christianity, practically none of them appear to center their doctrine or practices around Jesus’ words as found in the red letters of many bibles. Many seem to ignore his words and especially his commands!